CINCINNATI — With every heavy rainfall that moves through the Tri-State, drivers using one of the region's many hillside roads know their commute could turn quickly into a muddy mess. Take last week, when combined rain and melting snow and ice caused a landslide that closed Columbia Parkway in both directions for more than two days. "This is a very common occurrence along the parkway," said Eric Russo, the executive director of The Hillside Trust, a group advocating for "thoughtful use" of the region's many hillsides. 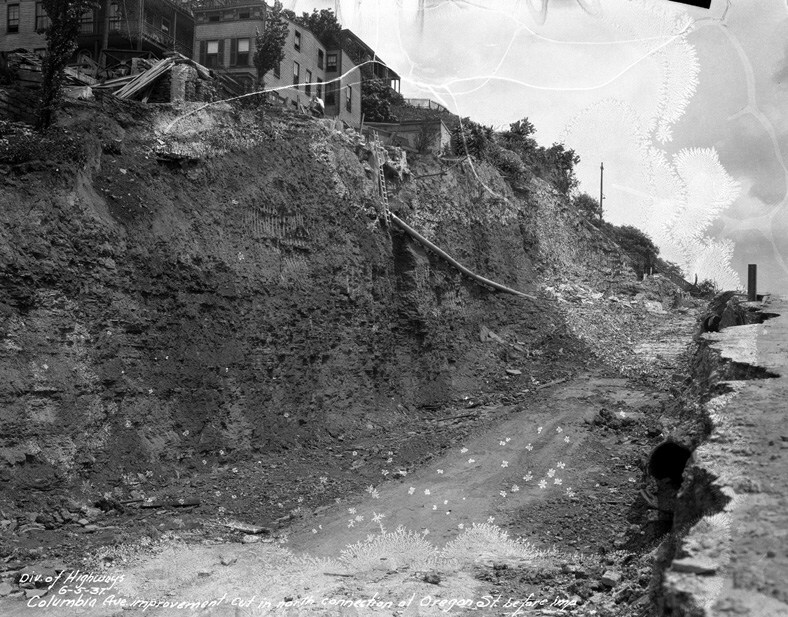 Built over the course of the 1930s, Russo said the parkway's retaining wall has never been tall enough to handle the slippage of soil onto the parkway. He also said the way in which engineers cut into the hillside to build the parkway has created lasting problems. "This parkway was built at the mid-slope of a hillside," he told WCPO. "Over time, the problem has been that, that wall is not tall enough to hold the hill back, number one. And number two, the hillside was cut back at such an angle that it's still trying to find its balance in terms of equilibrium at that degree of slope." In other words, the science behind the roadway's construction might not have been the greatest science. Mud and dirt, it turns out, make up Columbia Parkway's roots, according to University of Cincinnati librarian Angela Vanderbildt, who recently chronicled the parkway's history for the university's library. According to her research, Columbia Parkway began as "Columbia Avenue," a dirt road connecting east side neighborhoods to Downtown. "In 1929, the city of Cincinnati passed an ordinance to upgrade and expand the existing road, which at that time was named Columbia Avenue and was a simple dirt and gravel road that meandered above the Ohio River eastward from downtown," she wrote. Vanderbildt's history confirms Russo's account, that the hillside thoroughfare was not engineered properly to handle regional precipitation and gravity's pull on the hillside soil. "(T)he engineers failed to take into account the terrain and the angle at which the hillside was cut. This oversight, as well as a retaining wall that was built too low to hold back the debris which regularly slides down the embankment, resulted in a major hazard for parkway drivers which continues to this day," she wrote. And the problem might get worse before it gets better. That's because, while overall levels of rainfall might be holding fairly steady, downpour events -- that's heavy rainfall over a short stretch of a few days -- are getting more common, according to 9 First Warning Meterologist Jennifer Ketchmark. 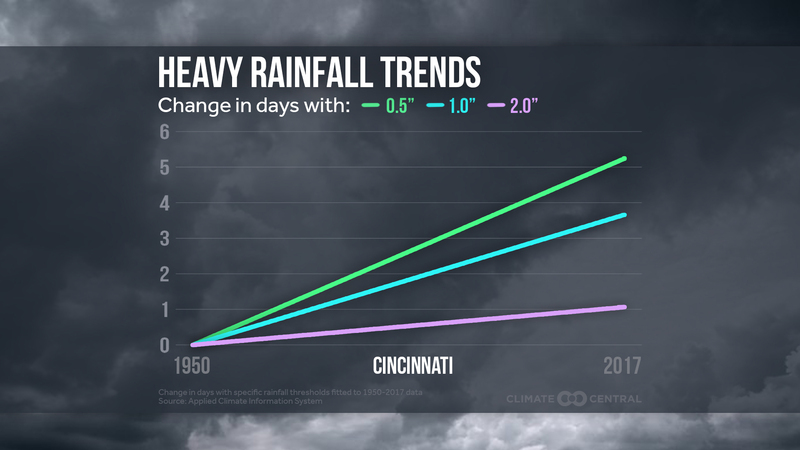 "When you look at the last several years in Cincinnati and in our region, we've seen an uptick in 1-2 day intense rainfall events, many of which produce record setting rainfall amounts," Ketchmark said. "Any time you get 2-4 inches of rain, regardless of the time of year, it causes a over saturation of the soil and an increased risk of mudslides and hillside slippage." In other words, it's not so much about the total rain in, say, a single month, but instead about how quickly that rain falls in an area. "Overall, the amount of rain in each given year hasn't been a record breaker, but it's the individual events that are producing at times, a month's worth of rain in 48 hours or less. This is what's become more common, thus the reason we are hearing of mudslides more often," she said. To measure these trends, researchers examined the number of calendar days each year yielding between a quarter-inch and 2 inches of rain, from 1950 through 2017. It's often worse in the winter months, Ketchmark said, due to a mix of snow melt and rainfall. "Winter heavy rain systems are made worse because we often see snow melt associated with the warmer air and excessive rain," she said. "Plus, to a certain depth, the soil is frozen or partially frozen, so it can't penetrate as deep in the ground, loosening the top layer of soil faster." Landslide's aren't just a problem for Columbia Parkway. Just down the hill, for instance, the city is in the middle of a years-long attempt to halt hillslide along Riverside Drive. In a Jan. 20, 2017 memo to Mayor John Cranley and City Council, then-City Manager Harry Black said his Department of Transportation and Engineering identified two areas of hill slippage there, one on private property and one on public property. The impacted public property -- which Black referred to as the "Western Slide" -- "may have the potential to damage public infrastructure if not abated," Black wrote. That prompted DOTE to launch a still-ongoing $20 million project to shore up the hillside. In the months since, DOTE has completed the first phase of the abatement project under budget, according to a subsequent Jan. 5, 2018 memo from Black. The most recent update to this project came from City Manager Patrick Duhaney in June of last year, in which he wrote: "While there are still signs of minimal movement in some areas, overall landslide movement has slowed significantly or stopped across the majority of both project areas since the start of construction. On Hillside Trust's website, Russo has documented landslides in other neighborhoods, as well, including East Price Hill, North Avondale, Mount Auburn and East Walnut Hills, among others. City spokesman Casey Weldon identified Columbia Parkway and Elberon Avenue as the "two most prominent" locations susceptible to landslides. "The city assesses and determines appropriate next steps for each specific situation, which could mean continuing to monitor a given location, or closing a sidewalk, lane or roadway if there is a risk to public saftey or infrastructure," Weldon told WCPO in an email. "During rainy weather, DOTE visits susceptible locations more frequently because conditions can change quickly." Pat LaFleur reports on transportation and mobility for WCPO. Connect with him on Twitter ( @pat_laFleur ).